1. Powerful magnet insert into sponge, can be used on kitchen memo sticking on refrigerator. 2. One side can be used for memo sticker, the other side can easily to be use for paper clip sticker and also many other iron items. 3. 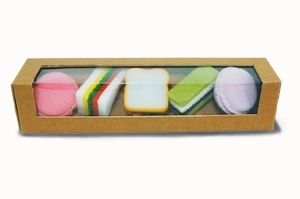 Almost real and adorable product appearances are perfectly suitable for office stationary gift. 4. Fine production line with quality assurance. Our products were made from highest quality sponge material with almost 30 years product manufacturing workers. SIVA sponge not only makes bathing sponge products, but creates many more other good sponge uses.